A Gooding woman faces up to 12 years in prison if Judge Robert J. Elgee follows the recommendation of the Blaine County Prosecuting Attorney's Office in a case alleging that the woman stole more than $500,000 while employed at a Bellevue real estate brokerage. 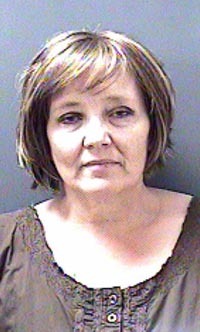 Tracy Dalin, 50, a former real estate agent and office manager at Sun Land Investments, pleaded guilty Monday in Blaine County 5th District Court to two felony charges, forgery and grand theft by embezzlement. Both crimes are punishable by up to 14 years in prison. In exchange for Dalin's guilty pleas, four other felony charges were dismissed. In accord with a plea agreement, Deputy Prosecuting Attorney Matt Fredback said he will recommend at sentencing that Dalin receive a 12-year prison sentence, with four years to be served before parole eligibility, on each charge with sentences to run concurrently. According to the plea agreement, Dalin can withdraw her guilty plea on the embezzlement charge if Elgee imposes a sentence greater than Fredback's recommendation. The plea agreement does not allow Dalin to withdraw her guilty plea on the forgery charge. Idaho Falls attorney Neal S. Randall, who is representing Dalin, told Elgee that under the terms of the agreement, he is "free to argue" for a lesser sentence. Sentencing was scheduled for Sept. 10. A separate restitution hearing to determine how much money Dalin must repay Sun Land Investments was scheduled for Aug. 20. Randall told the court that his client previously transferred some of the money she had taken back into company accounts. Dalin was charged with the crimes in August 2011 following a two-and-a-half-year investigation by the Blaine County Sheriff's Office. Detective Mark Dalton alleged in a probable-cause affidavit that Dalin stole a total of $530,794.72 from Sun Land Investments, company owner Judy Cash and Cash's friend Ron Farwell over a seven-year period. Dalton wrote that Dalin used various methods to take money, including forgery and unauthorized fund transfers and check deposits into her own bank account. "There were many, many transactions," Fredback said at Monday's hearing. "There were certain bank documents that were altered to cover up the money going into her account." Fredback further said that Dalin established a separate post office box that only she had access to in order to receive and alter bank statements before they were shown to Cash. Speaking quietly, Dalin admitted to forging Cash's signature and to embezzling money. Dalin is currently free on $25,000 bond. She was employed during the last school year as a home economics teacher at Bliss High School.